Today is an important day in the Norwegian calendar. May 17th, or Søttende Mai, marks the anniversary of Norway’s independence in 1814. 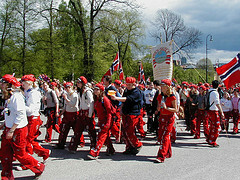 It’s a national holiday for Norwegians and is usually marked by celebrations, traditional food and children’s parades. 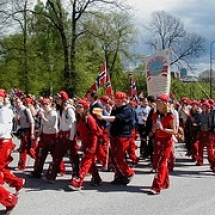 Søttende Mai is also celebrated around the world by Norwegians and their descendants. The date may largely pass us by here in the UK but there are communities which have special links with Norway, one of which is the Orkney Islands in Scotland. Here there are strong historical roots dating back to the time when the islands were inhabited by the Norse Earls for over 600 years. If you visit the islands, you’ll find frequent references to their occupation such as the magnificent St Magnus Cathedral in Kirkwall and numerous street names. One long-established group in Orkney ensures that Søttende Mai is marked each year. They are the Orkney Norway Friendship Association. Here we talk to the Association’s chair person, Ishbel Borland, to find out more about Orkney’s links with Norway. So why is it important for the people of Orkney to celebrate and continue links with Norway? I think it is important to continue our links with Norway as our cultures are very similar. Physically we are closer to Norway than we are to London, and with direct flights from Kirkwall to Bergen we can be in Norway in an hour. Many Norwegians travel across both to Orkney and to Shetland as they too feel a link with the past and want to see the areas where their ancestors ruled. What sort of events and activities do you do to encourage friendship between Orkney and Norway? As a society we meet once a month and either go to one of the islands or to a “country parish” to either have an evening of Norwegian music and a supper, or else we have talks or film shows about Norway and just try to promote Norway as a beautiful country to visit. We also do a lot of entertaining of groups who come across buy prescription drugs online without a prescription to Orkney (eg in February we put on an evening’s entertainment for a group from the Bergen Kulturforum) – in this way many new friends are made. I am a schoolteacher just retired this year and I have taken schoolchildren to Norway on 7 different years, as well as last year taking a group of 26 musicians from the Orkney West Mainland Strathspey and Reel society to Bergen. We also have an exchange scheme whereby two pupils from Orkney spend a school year at the Folkhøyskule in Voss and two students from Hordaland come to Orkney for a year. Where in Norway do your members live, or is there a particular region/place in Norway with cultural significance for Orkney? The area around Bergen – Hordaland, is twinned with Orkney so there are many council links between the two. One lovely custom is that Xmas trees are cut down in a town called Grimstad (actually in Rogaland) and sent across to be erected one inside and one outside St Magnus Cathedral each Dec, and we have a tree-lighting ceremony. (See pictures on our ONFA website). How do you celebrate Søttende Mai in the Orkney Islands? Another thing which we do which I think is quite special is that on the morning of May 17th we have a small ceremony in St Olaf cemetery where we have a piper play a lament, then we lay flowers on the graves of the Norwegian merchant seaman buried there. Then we sing Ja Vi Elsker and either have a song or a poem . This little ceremony started in a small way but has grown to be an important part of our 17th May, with many visiting Norwegian yachtsmen sailing across to visit, and making a point of taking part. This year we have schoolchildren from the island of Stronsay coming in to take part in the “tog” so that will be enjoyable for all. Explore the northern islands of Orkney crossing seas, causeways and rivers to uncover stories of these magical isles. Surround yourself with wildlife in one of Britain’s largest seabird colonies at Noup Head. Taste some local flavours including smokies, whiskey and wine.